My sweet Grandmother had a sweet tooth. Whether Bartons, Barricini, or Lofts, chocolate was the common currency of celebration. But Mothers Day meant only one thing- a Whitman’s Sampler. 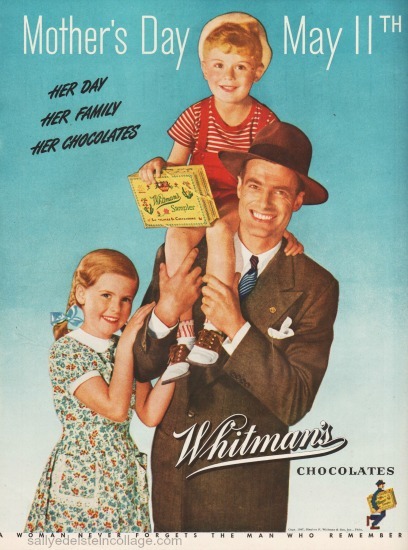 Through the years, that gift of chocolate has become more closely associated with America’s Mothers Day than any other. Every year at the precise moment the azaleas burst open in a blaze of color, my extended family gathered in our suburban backyard to celebrate Mothers Day. 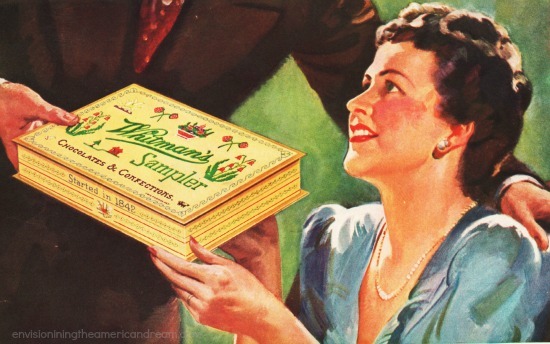 Along with a corsage, my grandmother, Nana Sadie, always received a Whitman’s Sampler in honor of the holiday. 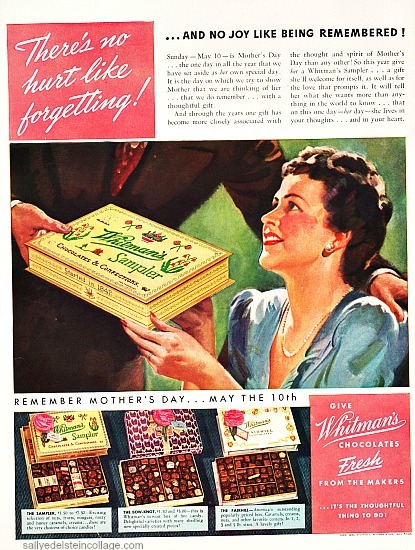 Between bites of rich chocolate nougat, Nana Sadie delighted in rhapsodizing about her life long love of chocolate in general and Whitman’s Sampler in particular. It was the same story year after year, relishing the telling as much as the chocolate. In 1912 when Nana was 12 years old, Whitman’s launched its famous Sampler. Nana would explain how she would eye the pretty yellow box in the window display of Gussmans Pharmacy the fanciest Drug Store on Bedford Avenue in Williamsburg. The yellow cross stitched designed box had an aged yet timeless look, as though it had been around for decades. Imagining the luscious treats that lay hidden in the box, had made her mouth water. It wasn’t long before a marriage of merchandising and holiday heaven was born. The following May 1915, Nana’s up-to-date father came home with a genuine Whitman’s Sampler box tucked under his arm and proudly gave it to Sadie’s mother. Squinting at the unfamiliar box, my Great Grandmother’s search for the familiar seal of approval was futile. No union of Rabbis had sanctioned these chocolate nuggets as kosher, so my very observant Jewish Great Grandmother, rolled her eyes and politely offered the box and its scrumptious contents to her welcoming children. Contrary to Whitman’s popular slogan, in future years my embarrassed Great Grandfather would remember to forget Whitman’s for his wife. Sitting on the front steps of their wrap around porch Nana and her 7 brothers and sisters eyed the candy box in wonder. Such a selection! Piped chocolate whorls, flakes of coconut, round shapes filled with mysterious somethings, rectangles shapes hiding everything from nuts to pralines to assorted fillings. A 15-year-old Sadie was in chocolate heaven. Her mother might forget the candy but Nana would long remember. Decades later, the sharing of Mothers Day melt-in-your-mouth chocolates became a family ritual as my grandmother would offer sweets to her eager grandchildren gathered around her. Part of the ritual was the opening of the box itself. Getting to the goodies themselves was a treasure hunt, leaving us salivating with anticipation until the first perfect square was lifted from the brimming box. Nana would carefully remove the outer cellophane wrapper- the first cellophane ever used in candy packaging she would remind us. Opening the lid revealed what is known as the “Pillow Puff” liner made out of embossed paper protecting the chocolates below. Nana’s first choice was always the Molasses Chew, the most distinctive piece in the box and worthy of the guest of honor. Covered in smooth dark chocolate with fancy white zigzag stripes, it was filled with nougat. While cousins fought over chewy caramel squares and the chocolate covered nuts shining with confectioners glaze got scooped up by my brother, I zeroed in on the cherry cordial, its plump maraschino cherry swimming in sugary syrup, encased in milk chocolate. 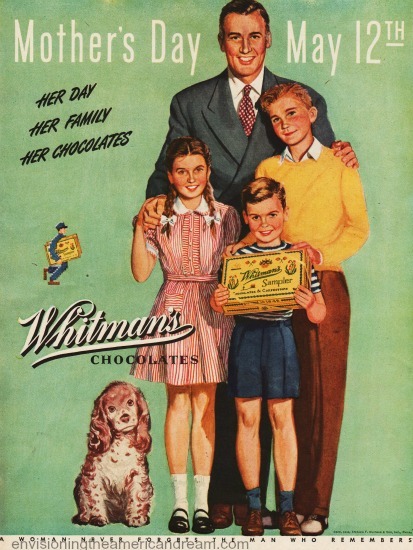 An incurable pack rat, Nana Sadie loved Whitman’s as much for the iconic yellow box as for the chocolate goodies inside. The candies long gone, the empty box would be saved for all kinds of flotsam and jetsam, objects evocative and sentimental, mementos never mentioned in a will or bequest, that eventually found their way to her grandchildren. Among the treasures were the bundles of saved Mothers Day Cards she had saved over decades and never had the heart to throw out.A most appropriate resting place. 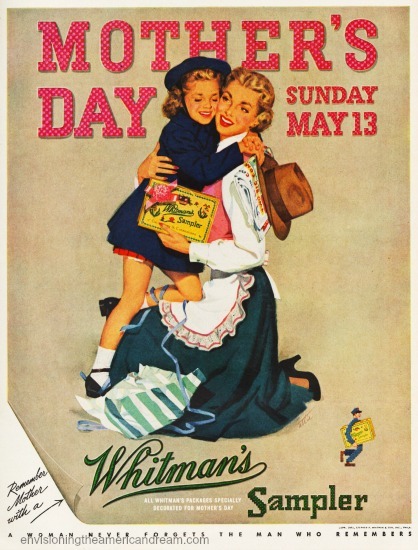 Yes there was Brooklyn’s own Bartons for Passover but Mothers Day meant Whitman’s. 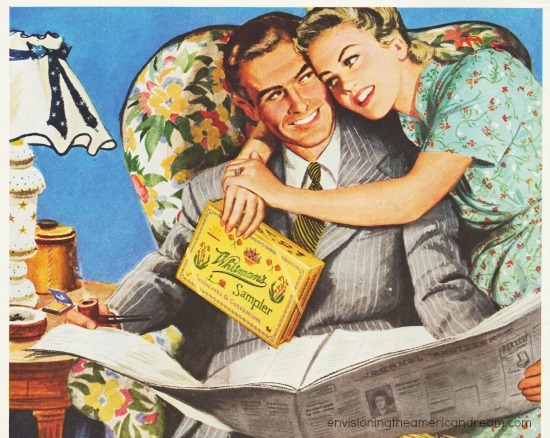 In 1939 Whitman’s launched Samplers most famous advertising campaign “A Woman Never Forgets The Man Who Remembers” the campaign remained popular for 2 decades. 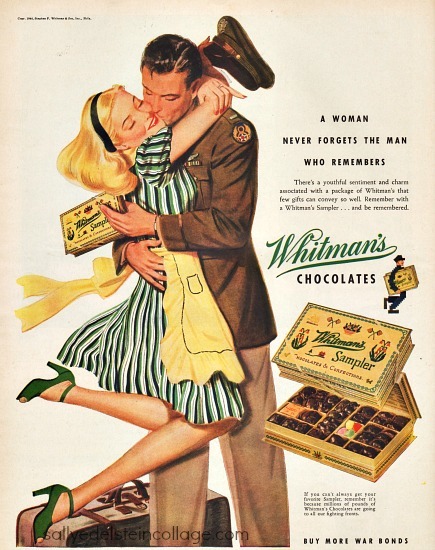 Between 1942 and 1945 Whitman’s sent 6 million pounds of chocolates to overseas servicemen in Land, Sea and Air tins. 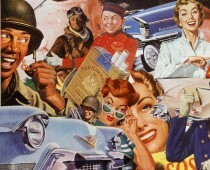 Women on Whitman’s production lines slipped notes into boxes to comfort fighting men. 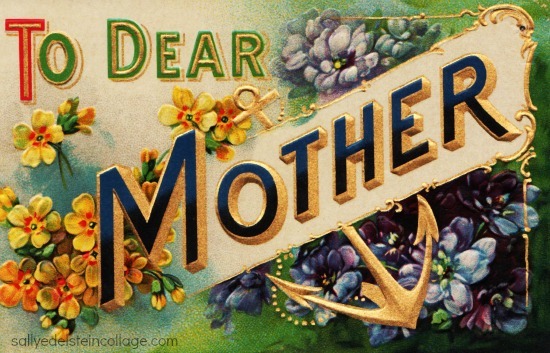 Many of these letters resulted in long-term friendships and even some post-war marriages, resulting in future Mother day celebrations.